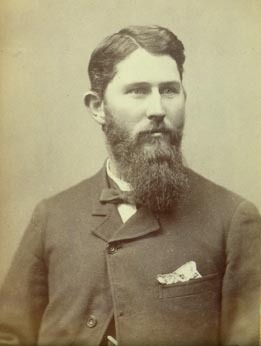 Hiram "Clyde" DUNNICK (see Hiram below) b. 1879 in KS. Called Clyde. 5 June 1918, WWI Draft Card list light brown hair & Brown eyes. Father, Chester, listed as next of kin. d. 15 March 1982 (SSDI) (Obit. March 29) Obit. published Mar. 30, page 31 and April 2, page 32. South Bend Tribune (IN) Resident of Cardinal Nursing Home, age 84. Cremated. d. 26 Dec.1984, Mishawaka, St. Joseph Co., IN. Her obituary was published "South Bend Tribune" December 26, 1984, page 72. She was a resident of Cardinal Health Care Center. "By 20 December 1980 both Harvey and Mildred were in a South Bend Nursing home"
1930 census has Harley A. age 32 a clerk in a grocery, Mildred age 32, and son Richard age 6. They indicate that Harley was 21, and Mildred 20 at the time of their marriage. Living South Bend Indiana. Source: "South Bend IN Tribune," Tues., March 30, 1982, page 31, cols. 1&2. Xerox donated by D. Sheldon COPELAND. Mrs. Joseph DUNNUCK of Greenwood, IN- (Name of parents) May 1971 indirectly through David DUNNUCK in 1999.// Richard's Obituary, "South Bend Tribune," June 2, 1944, section 2, page 1, formerly of South Bend, IN, formerly of Chicago// N. Gene Noble also donated a xerox of this obituary with a photo. d. 18 August 1918. Buried in Union Cem. Logan Co. IL. + George J. DUNNICK on 26 Dec 1872 in Mechanicsburg, Sangamon Co., IL. d. 4 April 1901 Peru, Miami Co. IN. Also living with them was a nurse & servant-unrelated. Living with Albert and Emma DUNNICK - relationship listed as "other"
Photo of family Tombstone (added later) from Shirley Gossick and records compiled by her sister Bonnie. b. 7 March 1859 in IN d/o Joseph and Susan BLACK at Prairie township, Kosciusko Co. IN where she lived her entire life. d. 10 September 1938 - buried in the Leesburg cemetery. Year: 1930; Roll: 598 - Page: 2A - Enumeration District: 29 - Image: 513.0. They did not have any children. Married late in life. buried IOOF Cemetery in Ellensburg, WA Plot: C-67-7 as are her son and his wife. b. Hazel 7 years old, born KS living in North Milton, Umatilla Co. OR in 1910 census. She is listed as N.H. Dunnick is listed in the 1905 census for McCune, Crawford Co. KS. - she is single and still at home with parents in 1920. 1930 census Melvin was Hazel were 29 & 27. living in Umatilla, OR. They were 23 & 21 when they were wed. No children are listed. Hazel and her father were born in KS. - Mother is not indicated. He is a farmer - Trucking Co., and she is a bookkeeper at a bank. my notes have her as Clyde, age 62. and Hazel as 32. They first wed when he was 50 and she was 27. So she first wed 7 years before and he 1st wed 12 years ago. Clyde b. IL/OH/OH Clyde is the office manager at a shoe company and Hazel a telephone operator. Hazel's sister Melanie BARNETT, age 19 single is living with them, and she is working as a stenographer at an oil company. Hazel's 18 year old niece is also in the household. d. April 8, 1998 Lived LaHarba, Orange Co. CA ---died April 8 of a stroke. Joseph d. 12 August 1962 in North Palm Beach, FL. Buried Union Cemetery, Columbus, OH. "lingering illness"
1920 Census, Helen age 16 still living at home with Frank & Lena. 1930 census she in no longer with parents. d. 10 November 1969 age 63, Section 23, lot 19 Tombstone has "Helen S. DUNNUCK"
Source: SSDI & obituary of husband Lyman A. published 6/13/1977 - clipping - don't know paper. A Helen Vernette OGLE obit was published in Loveland Co. Nov. 20, 2006 - wonder if this is related somehow. get Obituary published in the Troy Daily News, of Tippecanoe, IN. Wednesday, June 8, 2005. She may be the wife of John Dunnick Jr. also of Zephyrhills FL. A check of the SSDI indicates both received their SS cards in NJ. Glen b. 9 Sept 1923 in La Cygne, Kansas. He died 13 July 2001 in Mission, Tx (or McAllen Co. TX)and is buried in Leavenworth National Cemetery in Kansas. He was a Marine in WWII. . Son of Carl and Goldie (RUSSELL) RIHARD. Former Bonner Spring (MO or KS) resident. Source Jackson Co. Missouri. Marriages // Obituary of Glen Leroy RIHARD both give same birth date. From the Marriage license Helen L Dunnuck to Glen L. Rihard, They were 34 & 33 when the wed in 1956 so I assume Helen was previously wed to Dunnuck. Source: several on line locations: 1930 Polk Co. IA census// Best source is http://web.marshallnet.com/~manor/genea/niemants.html. wife of (might be Helen Louise, wife of James E. DUNNUCK who lived in San Diego Co. CA in 1944. Millpond Retirement Community in Ankeny, IA at the age of 90 years, 11 months and 24 days. Marie lived Mentone IN most of life. She was a graduate of International Business College and worked as a bookeeper for 31 years for Valentine Elevator and served 8 years as Clerk-Treasurer of Mentone, IN. Member of the Mentone United Methodist Church & wintered in Brandenton, FL. m. Luther "Luke" T. COLEMAN of Mentone IN. April 13, 1929 in South Bend, IN. They were divorced. Later Luther lived in Flint, MI and April 3, 1958 to a Marilyn Tucker. D. C. giving Donald's death and offering help and corrections. btz. 1 February 1805 St. James Protestant Episcopal Parish, Baltimore, MD. Living in Ottawa, Franklin Co. KS in the 1870 census. "She was the mother of 11 children, 5 of whom, with 18 grandchildren and 31 great-grand-children are living." 11 Children: Mary Jane and her twin Phebe Elizabeth, Benjamin Henton, William Elihu, Nancy Jane, Martha Mahala, John Fletcher, Franklin Scott, Marion Talman, Amanda Alice, and Douglas Lyman. "The toils and hardships of her life were those common to the pioneer as she with her husband labored to carve out of the wilderness a home, while surrounded by Indians, wild beasts and ague (ague-malaria fever)"
Known children: (1 son, 3 daughters) still be living in 1993. Bernadine age 9 in the 1920 Census. d. March 1, 1938 in Augusta, Maine. + #1 In 1896 he married Adella E. SMITH of Dixmont, Maine. The following year (1885) he graduated from the Bangor Theological Seminary, and two years later still, he received his BA from Bowdoin College. That same year he was ordained a Methodist minister. In 1900, he became pastor of the Green Street Church in Augusta, Maine. He remained there for 17 years. He was a published author. His book "The Maine Book", was published in 1920 and was followed one year later by the "Hand Book of Maine Government". "Maine Forts" was published in 1924 to be followed the next year by "Maine Methodism". He and Adella (SMITH) had two sons. 1900 Census for Augusta, Kennebec, Maine. All children lived in Maine, but grandchildren settled in Delaware and Colorado. Source Cheryl Dunnack, 2001 // Source dates on 2nd wife from Jack H. Merrill web page. of Dixmont, Maine, who died June, 13, 1913. Mr. Dunnack has two sons. Source: HENRY E. DUNNACK. Sprague's Journal of Maine History. child: Rena Dunnuck who married Hiram HARTMAN - funeral Palestine, Kosciusko Co., IN. gives birth as 11 January 1876, age 42 Wife Belle DUNNUCK, "Tailoring"
Payette, ID 1925 Appropriate music was furnished by an all-Masonic male quartette, consisting of Bert Dunnuck, J. H. Helman, H. E. Duel and Calvin Keller. Sang in male quartette. There are still born children (DUNNICK) b. in December 1928 & December 1929 in Blackfoot ID. Wonder whose children these were? b. circa 1904 per 1910 census . 1905 Census for Washington, Washington Co., KS has Elroy age 1 with A.E. and Minnie DUNNOCK all ages are correct. I think this is a descendant of John Dunnuck b. 1814, perhaps by Egbert Alphonza Dunnuck. Egbert lived at one time in Atchison KS, and John lived in the Hanover area. Roy and Louise operated the Madrid Theater in Atchison, Kansas until 1954 when they sold the theater to Dr. Donovan. The theater probably opened in February, 1932 according to an article about Theaters in the Atchison Enquirer. Later, in California Roy and Louise established a real estate business. + Louise Emma WILLIAMS-- 14 August 1944 Leavenworth, Ks. (her obit in the Topeka Journal has wed August 1943.
. . . . .From her obituary, Louise was born: 6 January 1918 Mount Pleasant (KS) Area (another source has Atchinson KS)., and "moved with her family to Atchison as a child and attended Atchison schools". She graduated H.S. there in 1935, and attended Texas Tech. University, Louise was the daughter of Charles Edwin Williams (Sr.) who was born October 9, 1885 in Effingham, KS and his wife Mary Ellen "Nellie" Hicks who was born February 26, 1891 in Doniphan, KS.
. . . .Louise d. 27 December 2002 and is buried in the Riverside National Cemetery in Riverside, CA. Source: California Department of Health ...& vital statistics, death index // marriage from Merrie Pinick // Obituary of Louise published Jan 3, 2003 Topeka KS) // Index of burials in National Cemeteries for Henry . Henry B. DUNNUCK, age 72 due to Paralysis. Died at home of son George Dunnuck in Burket, IN 5 children survive. George and Nathan of Burket, IN, Lyman of Palestine IN, Frank of South Warsaw, IN, and Mrs. Wilbur Shatto of Mishawaka, IN. Publ in the Fort Wayne New and Sentinel Sept 17 1918, page 14, column 4.
m. Phebe EVANS June 20,1858 in Pickaway Co. OH. (LDS gives date as June 2) Her parents born in VT. I think this may be an Error - I believe Willis' father to be Clarence, not Henry J. Clarence's 2nd wife was Pearl I don't know where Henry comes from. Source: Obituary of Willis, published January 3, 2001 Fulton County Daily Paper, Rochester, IN. Real Estate for 25 years. Survived by 3 children, 14 grandchildren, and 5 great-grandchildren. They lived two years on farm near Warsaw, 17 years on a farm in Center Township, and 31 years at 1010 E. Ewing Ave, South Bend. 1910 Census Centre twp. St. Joseph Co., IN. + 5 years age 21, Ethel 20. 1930 Census for South Bend, St. Joseph County, IN. has H. Otto age 48, truck driver for an oil and gas company, Ethel age 44, Roland age 22, a salesman for gas and oil company and Ada B. age 18 working as a "Girl" in an Auto factory. Otto was 23, and Ethel 19 when they wed.
Sources: Marriage records, St. Joseph Co., IN /// Obit. South Bend Tribune November 12, and 13, 1858// Obituary - Ethel - South Bend Tribune November 4 and 5, 1962, Record #60-5856 /// Clipping of Golden Anniversary with photo South Bend Tribune, April 17, 1955 donated by N. G. DUNNUCK///Will Index, (Ethel) St. Joseph Co. IN 1962 - 256, 2 /// 1910 St. Joseph Co., IN Census 1910 /// D. Sheldon COPELAND// WPA birth index for Henry O //1920 census for St. Joseph County County, Series T625, roll 463, part 1, page 59T// 1930 census. Henton Monroe DUNNICK - (the grandfather) a.k.a. "Roe" "Rowe"
b. January 24, 1854, Marcy, Pickaway Co. OH. d. 28 August 1883, Walnut Township, Pickaway Co. OH "lung disease" -- T.B. ? Sister Mary BROBST wife of Benjamin M.
Source for Sarah William A. Brobst of Kitty Hawk N.C. "Brobst/Probst Family History"
d. October 12, 1916 near Ashville, OH at home of her daughter Mrs. Boyd Swope. Mrs. Mary Ellen Dunnick, wife of Ex-sheriff H. M. Dunnick died Thursday morning at 10 o'clock at the home of a daughter, Mrs. Boyd Swope, of Amanda, of hardening of the arteries. Mrs. Dunnick had been in failing health for several years. One week previous to her death she went to the Swope home on a visit and became too ill to be taken back to her own home near Ashville. During her residence in Circleville she made many friend who will regret to learn of her death. She was a find type of womanhood and held in high esteem by all who knew her. 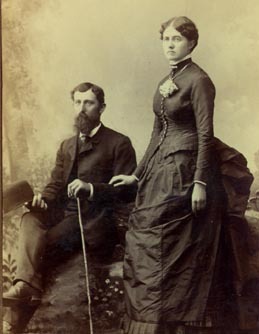 She was Mr. Dunnick's second wife and was married to him in 1889. Her maiden name was Mary E. Hammel. Besides her husband she is survived by three daughters; Mrs. Boyd Swope of Amanda; Mrs. W.C. Nothstine of near Circleville; Mrs. R. E. Crook of Lancaster; and two sons John T. Dunnick of Columbus and David H. Dunnick at home. Funeral services will be held at the residence near Ashville, Saturday afternoon at two o'clock. Burial in Reber Hill Cemetery. Children: David H. DUNNICK b. November 1890 & Minerva, (Mrs. Ralph C. Crooks) b. December 1891. Minerva of Lancaster OH in 1940, and David of Ashville, OH in 1940. Henton M. Dunnick, served as Sheriff of Pickaway County Ohio in 1892 and 1894. History of Pickaway County Ohio and Representative Citizens, Chapter XIX publ. by the Biographical Publishing Co. of Chicago, IL in 1906. Another source listing Sheriff's and their terms gives 1892-1895. 1920 census has "H. M." father living with David and his wife Edna. H.M. is 64 and widowed. Walnut township, Pickaway County, OH, Roll #1427, Book 1, page 161A, HH 192, line 41-44.
m. #3 Mariam LAWYER after 1920.
d. April 3, 1965 Licking Co. Ohio - (age 94 - widowed) at Pinekirk Nursing home in Thornville, OH buried at the Lutheran Reformed Cemetery. Mariam taught for 35 years at Glen Mills Military Academy in Glen Mills, PA . She also taught for six years at Thornville. She was a 1st & 6th grade school teacher at Thornville's North School. d/o James F. and Adeline (error- see below) LAWYER. source the obituary of her brother Glenn A. Lawyer published in the Newark (OH) Advocate, page 17, column 3. January 19, 1961. Siblings listed were Glenn A // Mariam DUNNUCK.// Charles // Raymond // Clarabelle "Clara" (Mrs.John) Watson // and Ann (Anna) Harman. Guy's obit lists Adeline's maiden name as WALTERS. See Guy's obit publ page 1& 12 on June 8, 1959. Adeline's obit. She was the daughter of Samuel and Catherine (Ashbrook) WALTERS - publ 16 May 1935 - listed as mother of 10 - 5 sons, 5 daughters. d/o J. F .Lawyer (His obit is published in the Lancaster Daily Eagle, Lancaster, OH Sept 1, 1926) He was the father of 10 children. He was the Justice of the Peace for 42 years and the Mayor of Thornville, OH for 25 years. He was buried in Thornville, Cemetery. d/o James F.(b. March 1844) Buggy painter and wife Adeline (b. August 1849)(Walters) LAWYER. (J.F. was the son of John b. circa 1818 and Mary Ann (McLaughlin)) Mariam was one of 10 children. J. F. d. circa 1924 (living in Perry Co. in 1860) - not listed in 1850.
m. after 1910 when he is still listed with Mary E.
1930 census lists ages as Henton M. 76 and Mariam 59. Mariam was a teacher in the public schools. They had been married about 10 years. They lived in Lancaster township, Fairfield Co., OH. d. check Mariam L. in the given name index. Is L. a middle name or maiden name? LDS list Miriam & "Roe" living in Thornville, Perry Co. OH. HENTON MONROE DUNNICK, a fine type of the gentleman farmer of old and cultured Ohio, owner of 215 acres of beautiful land in Walnut township, and former sheriff of Pickaway County, was born upon the farm which still comprises his homestead, on January 24, 1854. He is a son of Benjamin T. and Minerva (Ashbrook) Dunnick. His father was born, reared and educated in Walnut township and here became a prominent farmer. He died September 12, 1859. Our subject's mother was a daughter of William and Permelia Ashbrook, both natives of Virginia, and is still living at East Ringgold, aged 87 years. In Walnut township our subject developed into an intelligent and useful manhood, and in 1875 married for his first wife Sarah Ann Brobst, who died in 1882. By her he had three children, viz. : Iva, who married Boyd Swope, of Amanda township, Fairfield County, Ohio, and became the mother of two children--Kathleen and F. Dunnick; Oela C., who married William C. Nothstine, lives in Walunt township and is the mother of a daughter--Sarah Elizabeth ; and John T., who married Alice Plummer, of Columbus, and is assistant business manager of the Columbus Dispatch. In 1889 Mr. Dunnick married Mary E. Hammel. Two children were born to this union--David H. and Minerva. Mr. Dunnick purchased his home in August, 1896, and the family occupied it in 1897. It was during the latter year that he concluded his four years' service as sheriff of Pickaway County, having been elected on the Democratic ticket. He has a wide connection with the fraternities, being a member of the F. & A. M.. B. P. O. E. and I. O. O. F. Religiously he is identified with the Primitive Baptist Church. Mr. Dunnick takes great pride in his home, which is commodious and modern, and is prouder still of his family. He is especially gratified at the success of his youngest child by his first marriage, John T. Dunnick. When the latter was in the Circleville High School, (luring the father's term as sheriff, he took a local agency for the Columbus Dispatch. He acquitted himself so creditably that when he finished his course he was offered a position in the Columbus office as assistant bookkeeper, and his good work in that capacity earned him the promotion to his present post--assistant business manager. Mahlon Ashbrook, Mr. Dunnick's uncle, was the founder of the town of Ashville, which was named in his honor. About the year 1850 he was the wealthiest man in Pickaway County, conducting the largest store and selling more produce than any one in the county. In 1855 he met with serious business reverses, and the entire family, which is, one of the oldest, most aristocratic and honorable in the county, came to his assistance, and in the discharge of his indebtedness they were all reduced to comparative poverty. Get obit. 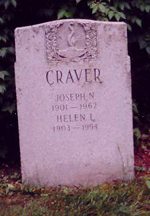 Grove City Cemetery - Grove City, Ohio, Jackson Township, Franklin County, Ohio. At time of death Emma was living in Nursing home Grove City, Franklin Co. OH, age 92. A Fremont DUNNICK is listed in the SSDI: born 2 May 1906, SS card issued in Ohio, and died April 1974. Listed as living in Oldsmar, Pinellas, FL. Might this be the same person ??? Dates are about right. An Emma DUNNICK is listed in SSDI as born 9 October 1905 & d. 24 December 1997 with last residence as Grove City, Franklin Co. OH. SSDI // Death Certificate #96179 at Ancestry.com// Her obituary is found in the Columbus Dispatch, published Dec. 12, 1997, page 12C. 1920 census has Herman with parents Abraham and Dora age 3 -3 months old. Center township, Indianapolis, Marion Co., IN. d. 17 August 1973, buried Calvary Cemetery, Indianapolis, IN. / of 315 Welcome Way Blvd. of Indianapolis // lived 315 Welcome Way Blvd. m. Barbara Ann WHEELER July 19, 1940 per the Marion County, IN, Marriage index 155, page 217. Source: SSDI // Their son, DLD, 1999/ Obit clipping dated 8/18/1973 - newspaper not know. Father : Edward Sale DUNNUCK / and mother Reddick (source death certificate - information on certificate provided by his daughter & grandson) Mother was Martha J. REDDICK, Edward's first wife. Marth died December 29, 1879 when "Clyde" was two months old. Draft card has October 20th, 1879 Blue eyes, age 38 and gray hair. (Weld Co. CO), wife Essie Daisy DUNNUCK. of Hudson, Weld Co., Colorado medium build, medium height. d. 9 January 1963 at Weld County Hospital, Greenley Colorado Buried Elmwood Cemetery, Brighton Co. Colorado. get Obituary available at the Denver Public Library. "Hiram Clyde Dunnuck was born October 20, 1879 in Hollenberg, Kansas. He left home at a very young age and didn't talk about his family. I have reached a dead end at this point. He married my grandmother, Essie Daisy DUNHAM, November 10, 1901 and had 3 sons--my father, Clfford Dunnuck, Roy Arthur Dunnuck and Clayton C. Dunnuck." Ran away from home at age 14. Check out Ruth (Elliott) Derrick, sister to the 2nd wife of John Dunnack Jr. - Elizabeth Elliott. Ruth is said to have raised a "Clyde" DUNNUCK. Also see the 1880 census where Hirman C. is called DERRICK.....Ruth's married name. click here. Note the similarity of her married name and the name Hiram "Clyde" gave as his mother on his Social Security application..
1895 census for Franklin, Washington Co. KS has Clid Dunnuck living with R.E. Derrick age 68 b. OH, and wife, R ? born IN. age 69. Clid is a school boy age 15, born in KS. Also see Clyde. m. Essie Daisy DUNHAM, Nov. 10, 1901 Red Willow County Nebraska. d. 11 May 1968, Brighton, Colorado. Buried Elmwood Cemetery, Brighton, Co. Co.
wife and boys all born in Nebraska. 1920 living in Hudson twp., pct 27, Weld County, Colorado. Source: 1930 census shows Hiram and Essie D. in Chicago. Roy, his 1st wife, and her mother are living with them. Roy was 25 and Gertrude M. 27. Mother, Margaret Holst was a 71 year old widow b. in Germany is living with them. Hiram is a Fireman - Stationary Engine, and Essie a Laundress. Source: SSDI /// Mary L. Dunnuck of Colorado. 1999, granddaughter of Hiram// her records include his birth, death, marriage certificate and social security applications. Hiram's obituaries: Published Denver Post Jan. 13, 1963, page 30C and published Rocky Mountain News, January 12, 1963, page 89.